Most questions in eschatology, asked at most times throughout Church history, are somewhat academic. If you lived any time from the second century to the early 20th century, the question (we now know) as to when the tribulation would begin was academic; the answer was not in your lifetime. But my understanding, and I know that many of my fellow Catholics agree, is that the tribulation will begin for this generation. Most of those persons who are alive today will see the start of the tribulation. Suddenly, many questions in eschatology are no longer academic. In recent times, many unfaithful souls have begun to realize that, when any question in religion is asked, the answer seems to have, from a secularized ‘religious’ point of view, no definitive answer. Many unfaithful Catholics have decided that they can answer questions on religion for themselves, giving whatever answer they like, regardless of objective truth. If Sacred Tradition or Sacred Scripture or the Magisterium teaches otherwise, they merely re-interpret what is taught to their liking. If the Magisterium teaches some truth definitively, they will explain, disingenuously, that the teaching is really not definitive. They use such severely disingenuous and absurd interpretations, that I consider some of them to offer these ideas in bad conscience. They don’t really believe what they are putting forward as the answer. Many theologians behave the same way; their theology is a clever scholarly rationalization, a lying excuse, and I doubt that they themselves believe what they are saying. But it seems to them that no one can prove them wrong, because many unfaithful Catholics and many unfaithful theologians will support their claims. And the Church has not, in recent years, taken much action against even those persons who openly teach heresy. In eschatology, many theologians have begun to say that the tribulation will not occur. They even claim that Sacred Scripture gives us no knowledge of the future, and that all of the eschatological passages of Scripture are merely expressions of hopes and fears, or expressions of persecutions that the Christian community was experiencing at the time the passage was written. As happens on other topics in theology, they consider that no one can prove them wrong. I suspect that many of these persons realize they are being unfaithful to the teaching of Tradition and Scripture on eschatology. How they justify their own words in their own minds, I have no idea. But in eschatology, for the present generation, some answers to certain questions are provably right or wrong. My own predictions of when the tribulation would begin have been wrong on that point several times. How much of my eschatology is correct or incorrect remains to be seen. But my predictions are specific enough so that this question can be answered. My eschatology on the first part of the tribulation places the entire first part within this generation, so it can be known whether any of my predicted dates and events are correct. Other authors write eschatology that is vague, not only without specific dates, but without specificity in describing events. It is just as difficult for them to be said to be wrong, as it is for them to be said to be right. As for those who claim that the tribulation will never occur, or that Sacred Scripture does not reveal, infallibly, certain future events, to unfold in a certain order at certain times, I believe that they will be proven wrong in this generation. Whether or not my eschatology is correct will also be proven, right or wrong, over the next few years. Given that eschatology is speculative and that I am fallible, I expect that some of my predictions will be mistaken. But as for those who claim that none of my work can be correct, wait and see. For many years, I have been predicting that the tribulation would begin with a preparatory event: an upheaval in the Middle East. I interpret the first Seal of the seven Seals in the book of Revelation, which is also the first horseman, as World War 3, a war in which the Arab/Muslim nations of the Middle East and northern Africa attack the U.S., conquer Europe and a vast territory, and occupy it for many years. The upheaval prepares for this event by bringing extremists to power in all of the Arab/Muslim nations of that region. Once in power, they join together as one group of nations under the leadership of Iran and Iraq, that is, of the new extremist leaders of those two nations. The Arab Spring (as the media are calling it) is looking more and more like the upheaval. The protests and violence are destabilizing the regimes of those nations, and threatening to bring to power new leadership, which supposedly wants democracy. Given that some protesters would like a democratic government, the current situation does nothing to guarantee that result. The groups that are rebelling against their governments are chaotic and not unified in leadership or purpose. There are apparently some persons in those groups who would prefer a fundamentalist Muslim government, some persons who are members of extremist organizations, some persons who simply desire power, along with those who are well-meaning. Unfortunately, the extremists are more violent and therefore more likely to seize power than the well-meaning protesters. The result of the Arab Spring could well be that extremists rise to power in some nations. My latest published predictions on the first part of the tribulation place the upheaval in 2011, from spring through summer. So it will soon be seen if I was correct on that point. I also said that the extremists would rise to power in some nations, and those nations would attack, in a small war, other nations of the region, so that if they could not take control of a nation from within, by coup or insurrection, they would do so from without, by open warfare. Though extremists have yet to take over any one of those nations, they seem close to doing so. What I did not anticipate was that the upheaval would be driven, in large part, by the actions of the U.S. and Allies (NATO). The U.S. is unwittingly helping extremists by backing the protesters and by using military force to help remove the current regimes and install new leadership. But once the current leaders are removed from power, the way will be clear for extremists to take over. Formerly, I thought that the upheaval would be driven by the Warning of Garabandal, which is a future event in which God touches the conscience of each person on earth. Those who refuse to respond to this gift with repentance will become more sinful, as well as fearful and desperate. But the Warning did not occur when I predicted that it would, and yet the upheaval does seem to be occurring. How can extremists take over all of these nations, when their leaders are so deeply entrenched, with so much power? With the help of the U.S. and NATO, apparently. The U.S. makes this type of mistake again and again. When the Soviet Union invaded and occupied Afghanistan (from 1979 to 1989), the U.S. gave support to the rebels, which included supporting Osama bin Laden. During the Iran Iraq war (1980 to 1988), the U.S. did not want Iran taking control of the region, so we helped Saddam Hussein. Both interventions by the U.S. were well-intentioned (I charitably assume) but ultimately very harmful. And now we are making the same type of mistake. They say “the enemy of my enemy is my friend,” but sometimes “the enemy of my enemy is another enemy,” or a worse enemy. Within a few months, it will be proven whether or not my prediction of an upheaval in the Middle East for 2011 is in error. If extremists take over those nations, this would suggest that I am perhaps also correct about the next event, World War 3, which is the start of the tribulation. These predictions are provably right or wrong. Eschatology as a field of theology is generally speculative. As a result, many Catholics treat eschatology with disregard or contempt. But Jesus gives an eschatological discourse in Matthew, Mark, and Luke. John wrote, under inspiration, an entire book of eschatology: the Book of Revelation (the Apocalypse of John). And both the Old Testament and the New Testament (including the Epistles and Acts) have eschatological verses throughout, in various books. So eschatology does not deserve the ridicule that many Catholics heap upon it. Speculative theology in general has little favor with conservative Catholics. They would like all theological propositions to be provable from magisterial documents, or at least from the clear teachings of the Fathers, Doctors, and Saints of the Church. However, the Catholic Faith is not based on faith alone, but on faith and reason. To live the Catholic Faith, we need not only infallible teachings, but non-infallible teachings (which may include some error), and fallible pious opinion. The Saints, such as Augustine and Aquinas, have often used much philosophy and reason in their theology. And although some Catholics tend to treat the writings of Saints as near-dogma, what many of them were actually writing at the time was speculative theology. And some speculative theology by some of the Saints has turned out to be wrong. For example, St. Thomas wrote against the idea of the Immaculate Conception (that Mary was preserved from original sin in the first moment of conception), instead preferring to speculate that Mary was saved only after conception. Today, that position would be heresy, but it was not so when he wrote it, since at the time the Magisterium had not decided the question. No one treats St. Thomas’ writings with contempt due to his errors in speculative theology. And yet it is common for some conservative Catholics today to say, if any theologian is in error on a particular point, or even if any theologian’s opinion on a particular point is different from their own, that his entire work is to be disregarded. Many Catholics have e-mailed me to say that, because they disagree with me on one point or another, that the rest of my work is not worth considering (but they tend to express this idea more crudely). This type of position implies that all theologians should be without any error in all that they write, for if any theologian is in error (or thought to be in error by the uniformed), they claim his entire body of work should be rejected or ignored. The result would be to reject all theology — and in practice this is how many Catholics live their version of the Faith. They have no interest in theology, especially speculative theology, unless it tells them what they already think is true. Or they have no interest in theology at all. I write speculative eschatology. The term speculative eschatology is redundant, since almost all of eschatology is speculative. It is inevitable that some of my eschatology will be wrong. It is inevitable, even when a Saint and Doctor of the Church writes speculative theology, that there will be some errors, since theologians are not infallible. Even when the Pope, who is able to teach infallibly, writes private speculative theology, he is not exercising papal infallibility. He can err in his theological opinions (e.g. Pope John XXII — 22 not 23). So only foolish persons will say, about my work in eschatology, that since I was wrong on several points so far, none of my eschatology is worth considering. And only persons who are both foolish and intellectually dishonest will say, about my entire body of work for the Lord Jesus Christ, that it is all to be rejected or disregarded because some of my eschatology has been proven wrong. These same persons are hypocrites, since they themselves put forward various ideas in theology, and these ideas can be proven wrong by a theological argument. And some of these errors in their work are not merely errors in speculative theology, but doctrinal errors in dogmatic or moral theology. Should I conclude that nothing they say, as a result of these errors, is worth consideration? No, there is still some good in their work. But their own position, that a few errors in speculative theology imply that the entire body of work should be rejected, thereby implies that their own body of work should be rejected. And some of their errors extend even to the teaching of material heresy. My eschatology is not infallible; there are some errors in my work in this field. 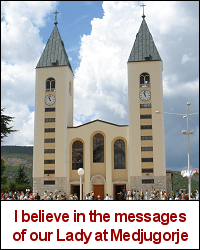 I have not re-written any of my eschatology books to account for my errors on the dates for the Warning and Miracle of Garabandal and the start of the secrets of Medjugorje. It is not necessary that I do so, since the reader should understand that eschatology is speculative and fallible. As for the Arab Spring and the tribulation, I believe that the Arab Spring is the upheaval that I have been predicting, and that it will soon be followed by the start of the tribulation in World War 3. If you have a different opinion on this speculative question, that is fine. But if you treat eschatology or speculative theology as a field with contempt or disregard, you are the one who is in error. My books in eschatology and other areas of theology. 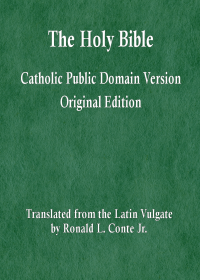 My translation of the Bible and my work with the Latin Vulgate. My articles on Tradition, Scripture, Magisterium. Gallery | This entry was posted in eschatology, theology. Bookmark the permalink. Are you still predicting a major terrorist event in New Yok (originally it was in 2010 I believe, a dirty bomb of some kind) as part of this upheval, and the nuclear missile strike in Rome (in 2013) ? What is your timeline like now for the predicted supernatural events (i.e. Warning, Consolation, Miracle) ? The prediction never involved a dirty bomb. If the Arab Spring turns out to be the upheaval, such that it brings extremists to power in that set of nations, then I think that an attack on NYC with a nuclear bomb (apparently made by Iran) would be the next event, the event that starts World War 3. But if the extremists do not come to power this summer, then I was probably wrong about the date of 2011 for the attack on New York. I still think that there will be a nuclear missle strike on Rome in July of 2013, as part of World War 3. But if World War 3 does not occur in the years leading up to 2013, then I would be wrong on that point. The next year that fits my understanding of the dates for the Warning, Consolation, Miracle is 2016. My thinking right now is that those three events occur after the tribulation is already underway.